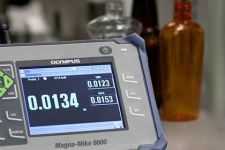 The Magna-Mike® 8600 is a portable thickness gage that uses a simple magnetic method to make reliable and repeatable measurements on nonferrous materials. Operation of the Magna-Mike is very simple. Measurements are made when its magnetic probe is held or scanned on one side of the test material and a small target ball (or disk or wire) is placed on the opposite side or dropped inside a container. The probe's Hall Effect sensor measures the distance between the probe tip and target ball. The measurements are instantly displayed on the large color thickness display as an easy-to-read digital thickness reading. The Magna-Mike is available with straight, right angle, and low-profile articulating magnetic probes. The 86PR-1 and 86PR-2 feature replacable wear cap to extend the probe's durability and reduce replacement costs. The Magna-Mike offers an expanded list of target options greatly extend its measurement capability. The Magna-Mike® has an extensive file-based alphanumeric data logger that is designed to easily store and transfer thickness readings. You have the ability to store thickness readings in one of four standard file formats: Incremental, Sequential, Sequential with Custom Point and 2-D Grid. 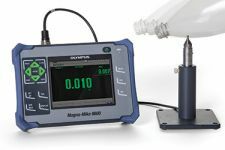 The Magna-Mike 8600 has RS-232 and USB outputs that enable the instrument to directly send data to an Excel spread sheet. The included WINXL interface program enables you to single send or file send thickness readings. Standard straight probe 82.30 mm (3.24 in) long and 18.62 mm (0.733 in.) dia. 86ACC-PR3-KIT (Q7800005) Low-profile calibration kit. Standard inclusions may vary depending on your location. Contact your local distributor. In applications such as plastic containers, simply drop the small target ball inside the container. The magnetic probe held on the outside of the container attracts the target ball. When scanning the probe along the surface or critical corners, the small steel target ball will follow. In the Minimum Mode feature, the gage continually displays both the actual thickness and the lowest thickness reading. The standard probe along with one of the two target disks and a replaceable chisel wear cap makes the Magna-Mike 8600 ideally suited for most automotive tear seam applications where measurements need to made in a thin channel or groove. The Magna-Mike has been successfully integrated into quality control programs to measure aerospace parts made of composites and nonferrous materials. The wire targets can be inserted into cooling holes in turbine blades and the larger magnetic target balls can be used to measure jet engine parts up to 25.4 mm (1.00 in.) thick.